Whether your business is brand new or you have been doing it for years, growing a T-shirt business can be a challenge, but it doesn’t have to be. You just have to be efficient with your time, be mindful of your money, and know where to get the solutions to your problems and answers to your questions. To get you started, here are some little-known strategies that will help improve your T-shirt business. A professional heat press is the most important piece of equipment you need to run your T-shirt decorating business. There is a heat press for every level of experience and every budget out there. How do you know which heat press will work best for you? You’ll want to know what you’re going to focus on pressing and what you can afford. Here are the top questions you should ask yourself when it comes to choosing the right heat press: What do you plan on decorating, how often do you plan on using your heat press, and how much space do you have? If you plan on heat pressing a few hundred of shirts a day, or for several hours at a time, you’ll want to consider an automatic heat press. These presses are as easy as they sound – you program the pressure, the temperature and the press does the rest. It will automatically lift off the design when it’s done. But on the other hand, if you are working with anywhere from a handful of shirts to a moderate amount, a manual press will be just fine for your needs. Either way, you’ll want to make sure you invest in a good heat press. You’ll see heat presses out there for cheap, but it’s important to do your research and don’t cut costs when it comes to your machinery. You will definitely want to consider spending more than $300 for a heat press. There are three styles of heat presses that you will have to consider as well – A clam style, a draw press and a swing-away press. A clam style press is typically the smallest, lightest and has the smallest footprint. This style opens up and down like a clam – hence the name. On a draw press, the bottom platen will pull out like a drawer while the top platen stays in place. This gives you more space to align apparel but also requires more room. The third press style, the swing-away press, is very popular for high performance shops. The upper platen swings away to the side allowing the operator to have more room for alignment and placement. But this style of press requires the most room of the three. If you’re looking to get your first heat press, or are looking to expand – check out this highly educational heat press buying guide from Stahls’. In it, you’ll find everything you need to answer all of your heat press questions and more. When starting a T-shirt decorating business, we suggest tailoring your efforts to a niche, or rather, a specific group of people who are joined by a common interest. The most important thing to consider when determining your focus is keeping your niche specific enough to appeal to a large amount of people while preventing it from being too large or unfocused. For example, “women’s apparel” is too large of a market. You’ll want to narrow that down – women who ride motorcycles. That’s more of a tailored market, but not so specific that you won’t have a large enough customer base. Some business owners may be afraid that narrowing their business to a market is limiting or can be disastrous if you’re in an area with a lot of competition. So how do you stand out in your market? Take a look at the things you can offer this specific market that your competition isn’t. Do you offer creative designs that aren’t available anywhere else? Do you have a unique story about the origin of your business? Can you provide faster turnaround or discounts that your competition doesn’t offer? But no one says you have to limit yourself to one niche. Say, for example, you’re personally interested in classic cars and want your niche market to focus on vintage car shirts. You might be concerned that there aren’t enough classic car enthusiasts in your area to keep your business lucrative. That’s ok! Use your passion for cars to expand your market to related topics like motorcycles or watersports. Focusing on a niche you’re personally interested in is useful because not only do you know what this group values and what appeals to it, but you’ll be able to clearly understand their needs because you’re a part of it. Who is your target customer? Are they internet savvy or are they spur-of-the-moment shoppers? Who is the competition? Are they servicing the market in the same way you want to? Is this a stable market or is it a trend? If it’s a trend, is there a bigger part of the trend that you can focus on to make it a bit more marketable for the long term? The definition of trend is “the general direction in which something is developing or changing.” This couldn’t be more accurate for fashion, as it’s forever changing over time. Not only are the influences of the style changing, the products and materials are consistently improving and changing as well. One of the things that will always stay the same while you’re following style trends is what to consider for the material. Here is a guide to selecting the perfect T-shirt. 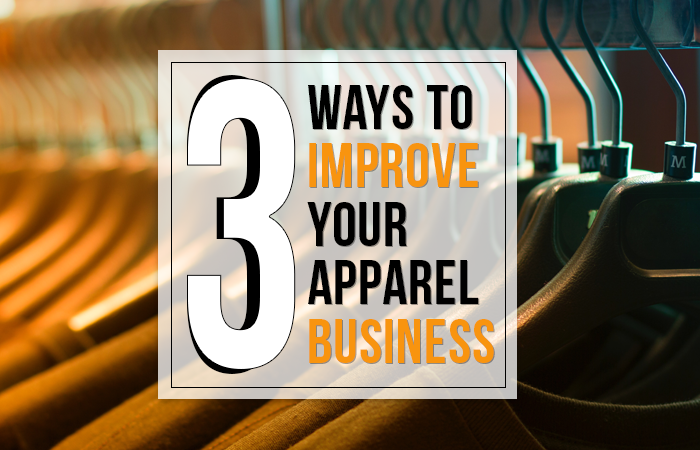 To help your customer choose apparel, you need to have samples. Samples allow your customers to feel and see their options so they can make a more confident decision on their purchase. There are many different ways to show samples. Here are 7 ways to shop samples. These are just three ideas that can help you take your business to the next level. Do you have some tricks or tips that have worked for you? Share them in the comments!